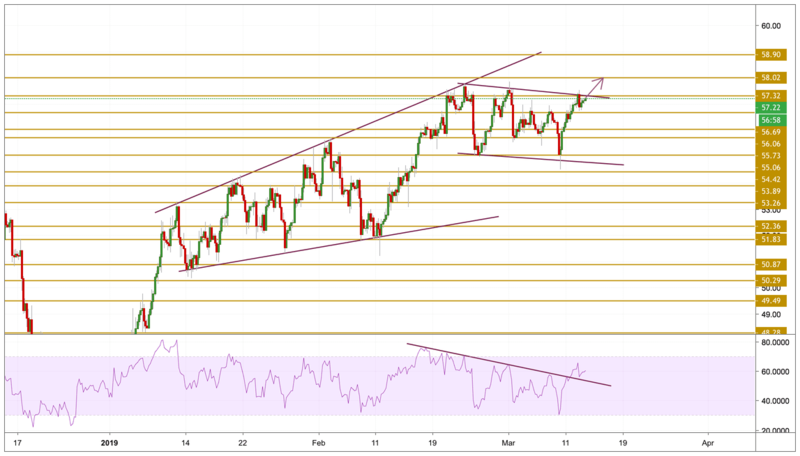 WTI is taking the bids around $57.00 during early Asian hours on Wednesday. The energy benchmark manages to remain firm as private inventory data shows a surprise draw in weekly stock. Reports of supply cut extension and EIA forecasts were the drivers during Tuesday session. The American Petroleum Institute (API) released details of stockpiles survey for the week ended on March 04. As per the results, crude oil inventories surprisingly registered a draw of -2.58 million barrels compared to a build of 7.29M during last week. Adding to this, energy traders maintained their buying bets as the latest news from OPEC members signaled readiness to extend supply-cuts. Crude oil prices tried to break above the channel's upper band but failed during Tuesday's session but remain on the bid this morning. The price is currently trading just below the $57.32 resistance level with a build up in the momentum. We expect an upward move breaking above the channel and the next level we will be focusing on is the $58 resistance level.